Chef Andrew Wong has done it again. 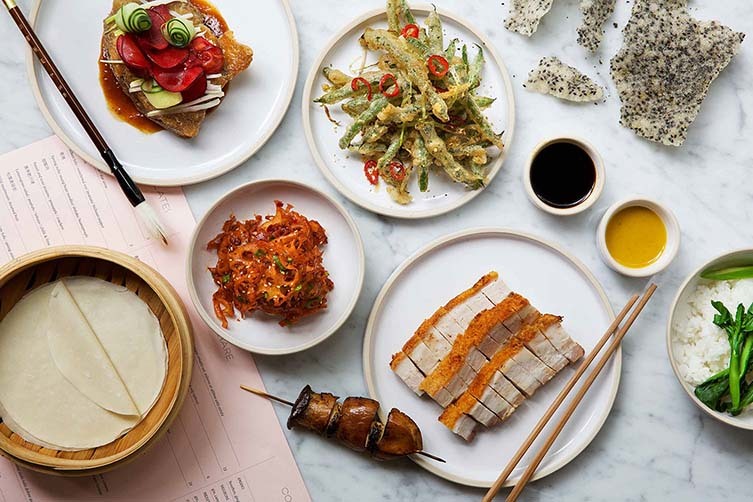 His latest restaurant—Kym’s, housed in the shiny, towering Bloomberg Arcade in London’s city district—is setting off the capital’s taste buds with a bold and stylish ode to the Chinese cooking of his forefathers. 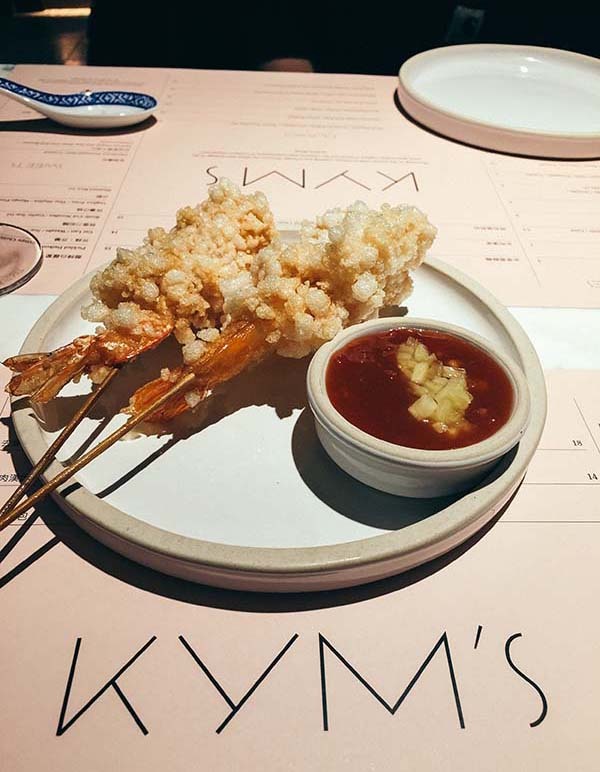 Kym’s is sweetly named after his grandmother and the original restaurant founded by his family in Victoria, London, in 1985. 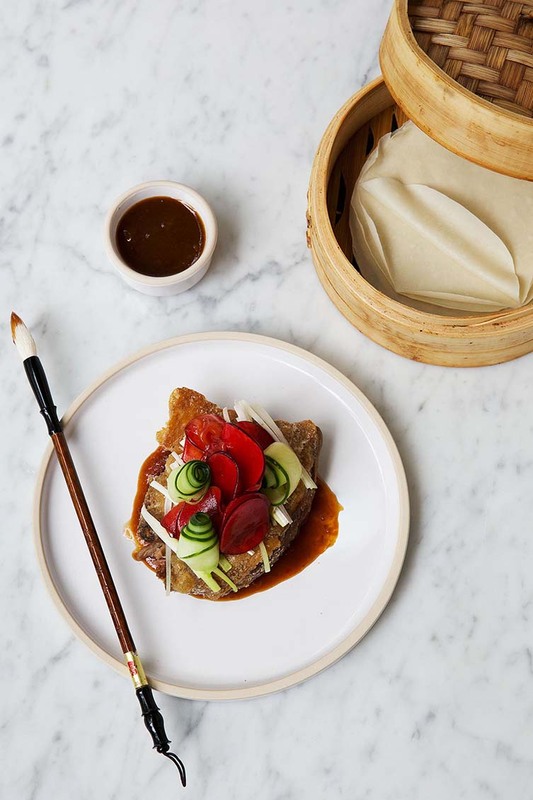 Known now was as A. Wong, his team earned their first Michelin star this year. Admirably, Andrew didn’t study cookery or hospitality until much later on in life—instead taking chemistry at Oxford University and then anthropology at the London School of Economics. It was the unfortunate death of his father that rekindled his passion for the family business and Chinese culinary culture, and so promptly quit academia to study culinary classics. 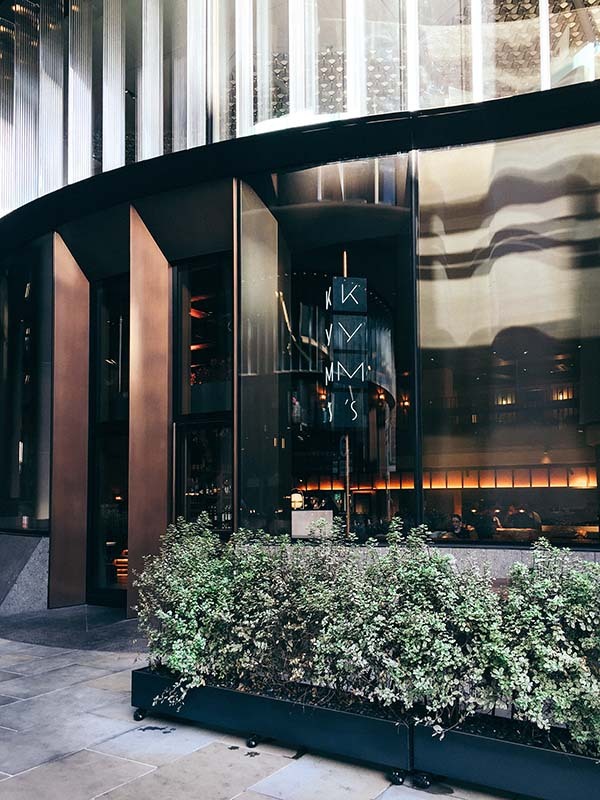 On arrival at Kym’s, a waved metallic exterior impresses, and the revolving KYM’S sign—which reminds me of an old cinema, or perhaps a roasting spit—is an immediate draw. 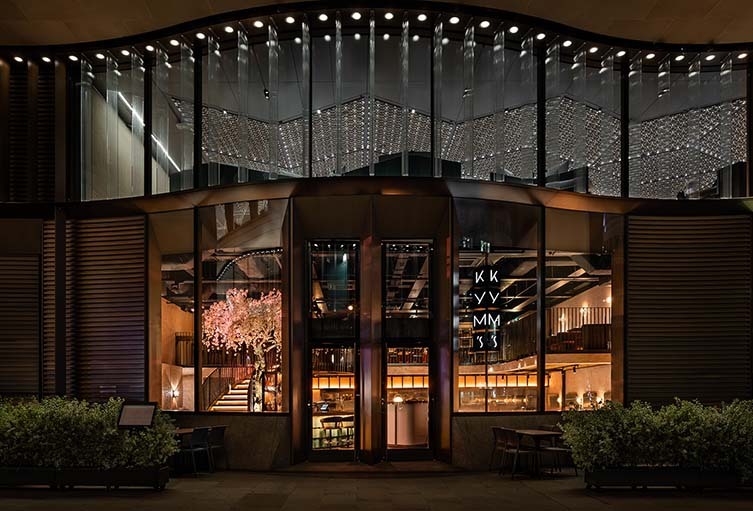 A giant cherry blossom tree greets you alongside panoramic views of the entire restaurant. Award-winning Michaelis Boyd were responsible for the interior design, and have created a fine, elegant space. The exterior curves are paralleled inside at a semi-circle mezzanine level. 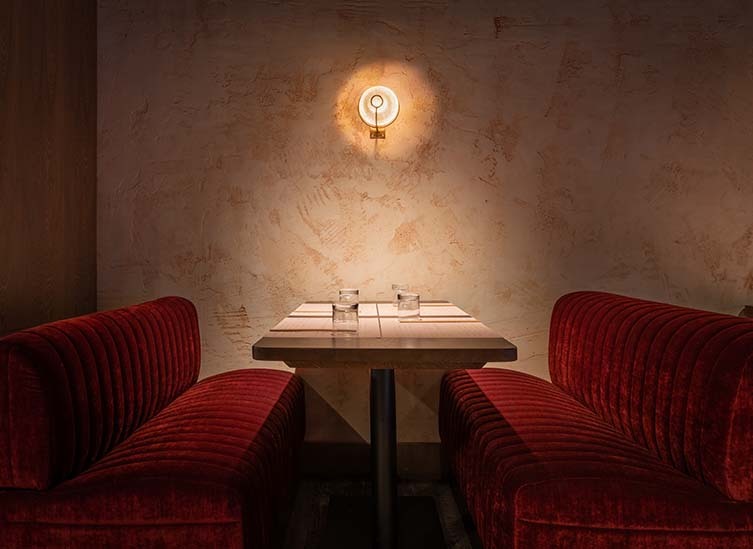 Marble features on the tables, and the food bar glows thanks to Chinese lantern-style boxed copper lighting panels—wilst the flow of the restaurant continues along the banquette seating, mirroring the illuminated drinks bar. Although utterly modern, there are nods to the classic-era of the 1920s. 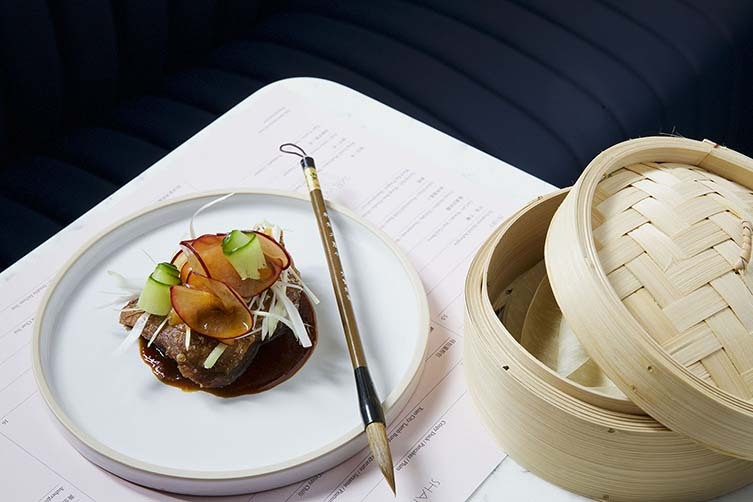 It feels as though that art deco period might’ve inspired the branding and printed menus, as an element of cinematography emulates—there’s a sense of the 1962 movie In the Mood for Love, and it is all quite enchanting. Our amiable waiter Lorne is on hand with recommendations for drinks and eats—the pink and black menu looks fabulous—and we begin with cocktails. The ‘Kym’s Spritz’ with sake, riesling vermouth, lemongrass and prosecco is aromatic, refreshing, and a fine place to start. He suggests six to eight dishes for two, and urges us to try some of the menu favourites. Having seen enviable photos on Instagram since the restaurant opened, I wanted to try the entire menu. First to arrive are the tiger prawn skewers with sweet chilli. Seemingly ordinary in print, the two whopping prawns are covered with savoury popping cracker. The prawn inside is generous, and the crackling sensation and flavour floor me. They’re also fun too, and as we look around, almost every table has ordered a round. 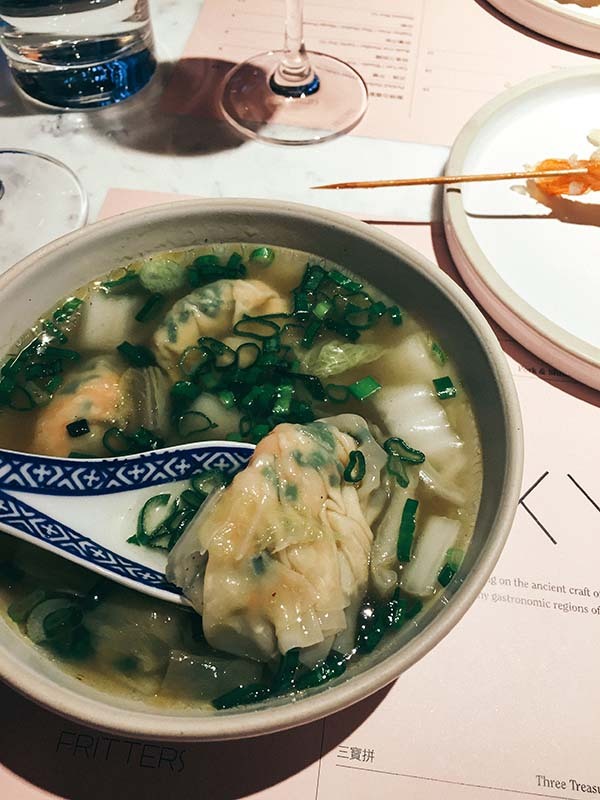 New on the menu is the prawn wonton soup with XO sauce. It’s clean, looks delicate and innocent, but then smacks you across the face with peppery heat. 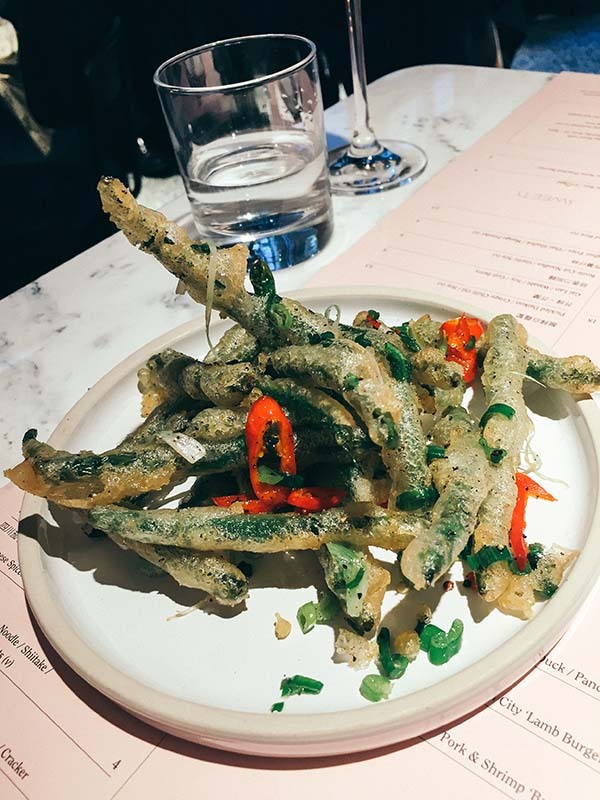 The French beans tempura style arrive next, and they’re sweet and salty and look great on the cool and contemporary plate; which, as an aside, are designed by Surrey Ceramics. With appetites racing, soon arrives one of the showstoppers of the meal. 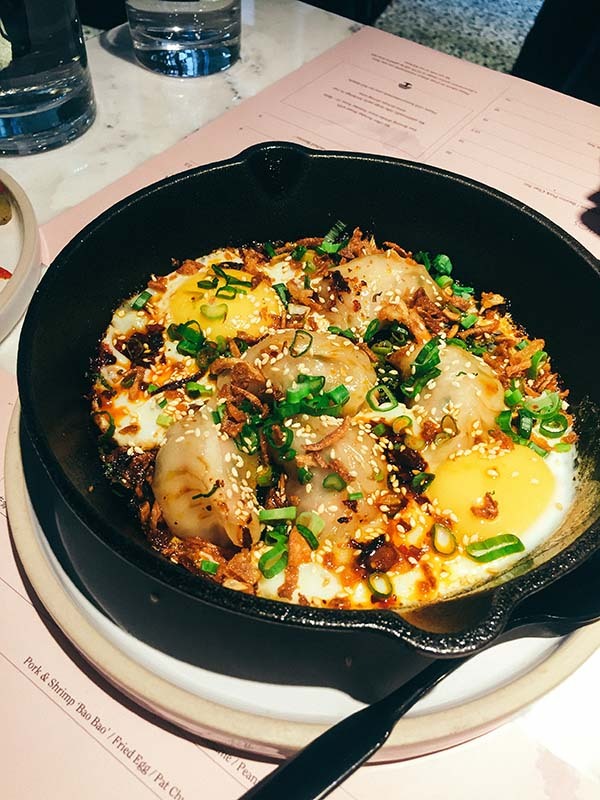 The pork and shrimp ‘Bao Bao’ is a dish made up of my two favourite things: dumplings and eggs. 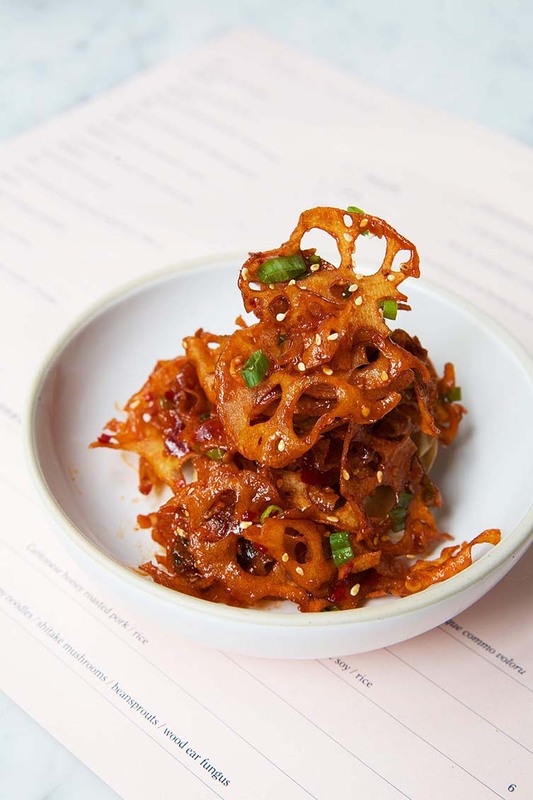 The dish is accompanied with Pat Chun and crispy chilli. 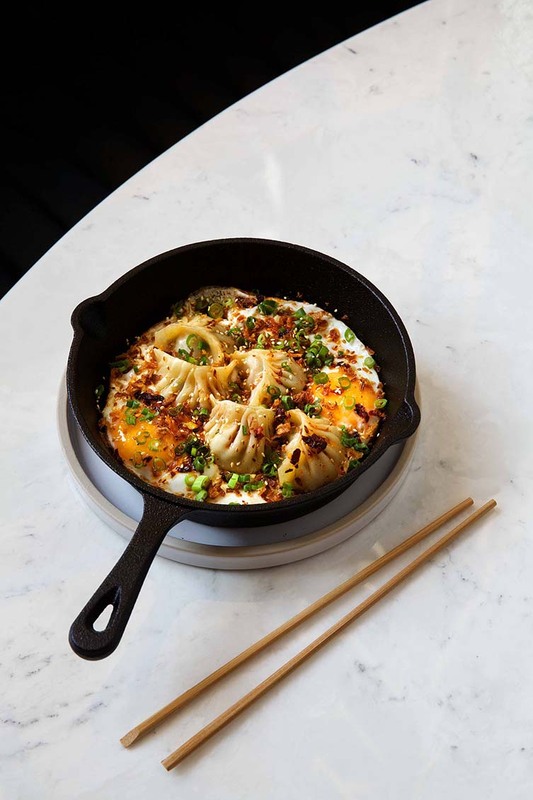 The pot-stickers are served in a skillet with fried eggs with sweet undertones of the Pat Chun sweetened vinegar, and lots of fiery crispy bits. 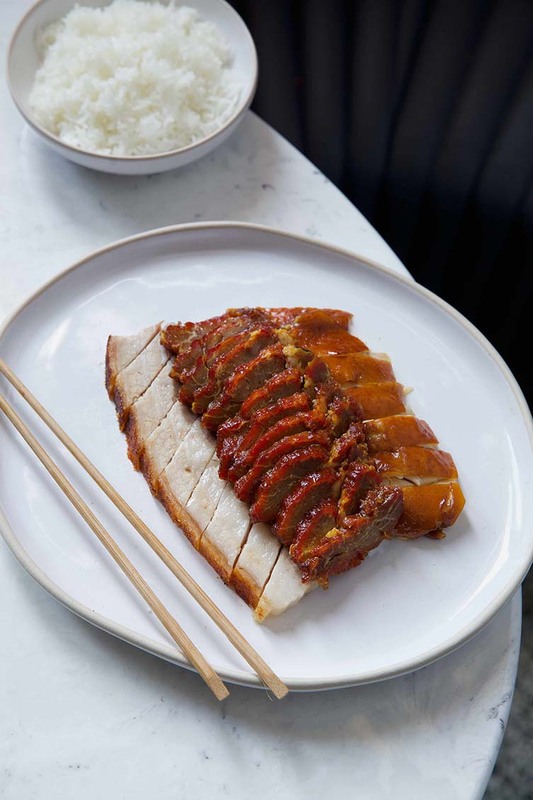 Because Andrew is so passionate about traditional Chinese meat roasting, we are urged to try the ‘Three Treasure’, a classic dish consisting of crispy pork belly, soy chicken and Iberico pork char siu. It is unlike any plate I’ve ever ordered. The chicken, lovingly boiled in an aromatic bath of soy is probably the best chicken I have ever tasted. Sweet, aromatic, and almost perfumed, the skin atop not crispy, quite easily melting. The pork belly is so rendered down that there is very little fat left, and what remains, is crispy and light. The Iberico pork char siu is pink and pretty with notes of heavenly sweetness. 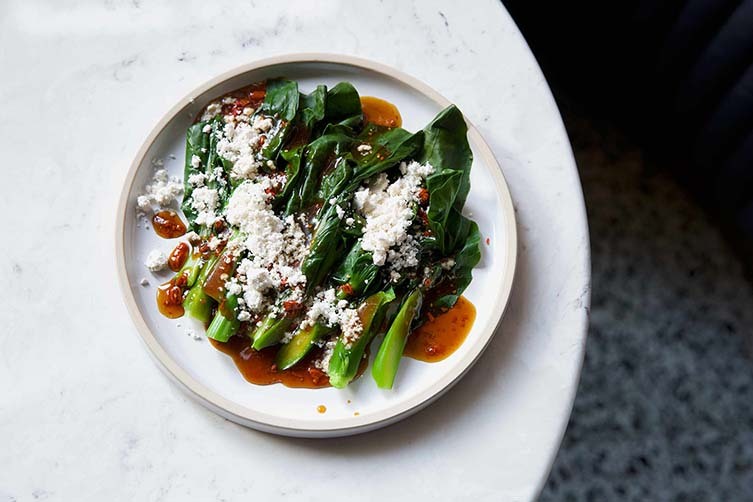 Perfect for sharing with a side of Gai Lan (Chinese broccoli) with goji berries and wasabi. Interestingly, it takes over 24 hours to get each meat to the desired texture, flavour, and consistency—which is key to Andrew’s cooking. It may be a labour of love and respect for Chinese culinary tradition, but it’s worth every second, and makes everything here feel and taste all that more special. Drinks too are a key feature on the menu at Kym’s, and you can pop in just for a cocktail rather than a full on meal. 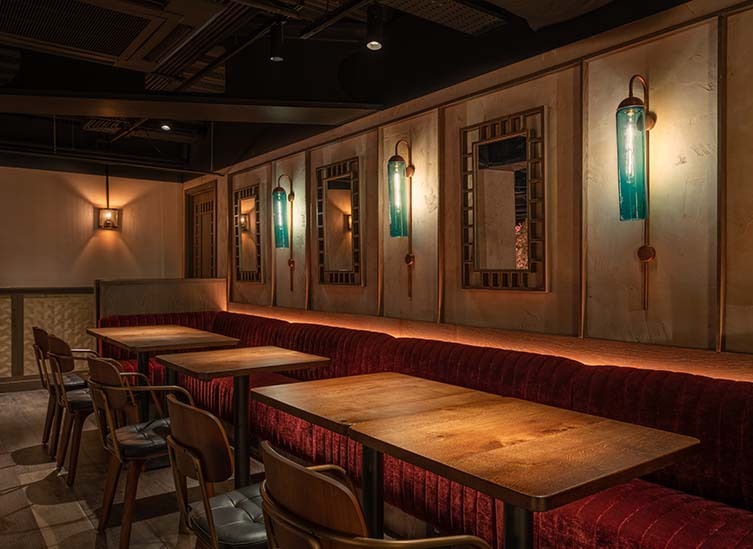 There is a dedicated bar and mini cocktail lounge which, for a 120-seat cover, is quite a treat. 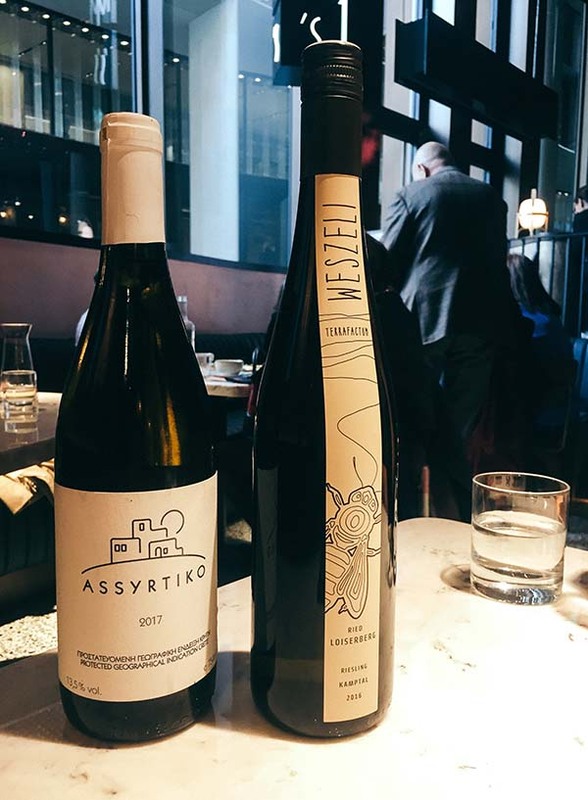 We’re impressed with the Assyrtiko Lyarakis wine from Crete—which goes with pretty much everything on the menu—and the Austrian Riesling Weszeli Loiserberg. If you have space for another cocktail, I urge you to try the Lucky Lychee Martini with tamarind-soaked cherries, vodka, sake, lychee, and lime. Without the typical lychee sweetness you might expect, it is utterly delicious and sophisticated. 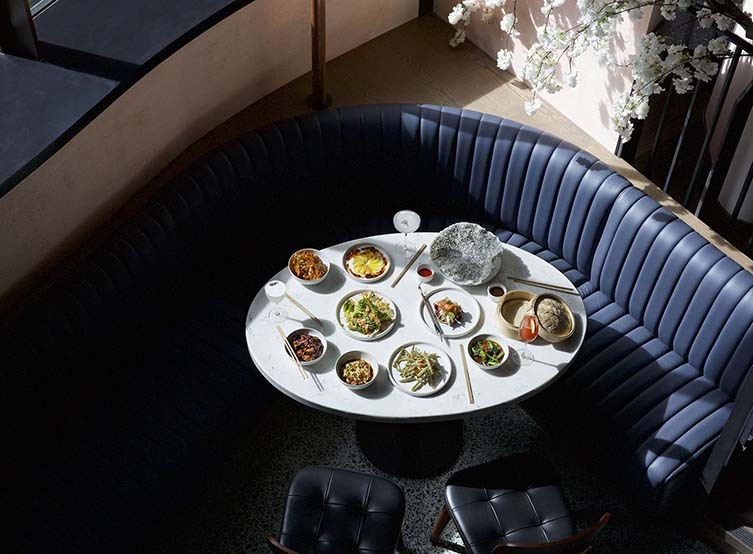 Much like the menu and interiors, an outing to Kym’s will not disappoint—instead reinvigorate the senses with a heavy dose of style and substance.